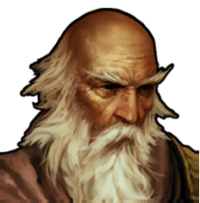 Deckard Cain, or Cain the Elder, is a returning NPC from previous Diablo games, who in the past have been the main source of identifying items as well as helping the player through the quests of the story line. Cain returns in Diablo III, and reprises his role as an advisor and lore-master for the player. How could he not? Cain is the essential NPC in the Diablo universe. As a wise sage and the last of the Horadrim, Cain has played an important part in both Diablo 1 and Diablo 2 games. This old, classic Diablo character will definitely ask you to stay a while and listen. Cain appears as an NPC, but it's not known if he'll pick up where he left off in Diablo II; following your character from town to town and offering item identifications and quest/plot info. He did not appear in the BlizzCon 2008 demo or the BlizzCon 2009 one. He was seen previous to that, in the gameplay video from WWI 2008. In that video the Barbarian and Witch Doctor rescue Cain from a horde of monsters in the dungeons beneath the Tristram cathedral, and return him safely to town where Leah is worried about him. When Deckard Cain returns to the ruins of Tristram Cathedral seeking clues to defeat new stirrings of evil, a fiery harbinger of doom falls from the heavens, striking the very ground where Diablo once entered the world. More information from (but not about) Deckard Cain can be seen in the Deckard Cain's Journal. It functions as a cheat sheet to events in the Diablo series, covering all the background information from the previous games including time retcons to make the universe more streamlined. Michael Gough, the voice actor who has played Deckard Cain in all three Diablo games, has been interviewed. Surprising news broke in December 2011, when it was revealed that the name Deckard Cain was taken from a a fan submission via a PC Gamer magazine contest. Better yet, a father submitted his infant son's name, "Deckard Elder Cain," which was chosen as the winning entry. As this was back in 1996, the child is now old enough to appreciate his legacy. Aside from being immortalized with his name on the most enduring character in the series, the winners received Diablo swag, a personalized letter from Bill Roper, and a custom statue of Diablo. Refer to the news post for full details and images. Fans have long speculated that Cain will die in Diablo III. How is open to much debate, with theories ranging across the board, though everyone agrees it would have to be a major element in the game's plot. Chris Metzen spoke on this possibility during an interview about the Book of Cain. The introduction to the Book of Cain reads as if Deckard is saying goodbye to his niece, Leah, perhaps passing on the torch to the younger generation. Is this foreshadowing? Is Deckard going to die in Diablo III? Jay Wilson spoke about Cain's personality in an interview from BlizzCon 2008 . According to Jay, Deckard is darker and more somber this time. It's been twenty years since the events in Diablo II, and Cain's spent that time questing for more ancient knowledge, and trying to warn his fellow citizens that the danger is not past. No one listens, people don't want to believe or think about such things, and Cain's grown increasingly desperate. He's now a tragic, reclusive figure. Jay Wilson: Well, Cain's obviously a lot older, reaching towards the end of his life. One of the things that has plagued him all these years is that growing up, he was never much of a believer in the Horadric Order which was kind of handed down to him. It wasn't really until the events of the original Diablo that he came to realize this was all true, a serious threat. Throughout the original Diablo and Diablo 2, he re-familiarized himself with what he grew up with. He's spent the last 20 years trying to atone, he's always felt that if he had been more active earlier on, maybe he could have stopped it, maybe he could have prevented all this from happening. So that's what he's spent this time trying to do, trying to figure out how he can put an end to all of this and stop it once and for all. His urgency has become even stronger, because he knows he's reaching the end of his life. So it's made him fanatical, a little bit, a darker character. Cain seen with Leah in the Caravan: August, 2010. Cain is the last in a long line of the Horadrim brotherhood, and he was told the stories of the brave Horadrim by his mother . He is not a warrior mage, but is more of an archivist and loremaster, who does what he can to fight against evil by sharing the knowledge he's accumulated over a lifetime of researching the demons that menace the lands of Sanctuary. He was inspired to study these topics as his mother inspired him with stories of his Horadrim ancestor Jered Cain. Deckard Cain himself is well known to the forces of Heaven, and has interacted with the Archangel Tyrael on numerous occasions. During the events of the first and second Diablo games, Cain wrote in a journal, which have been found today, many years after Diablo was (once again) defeated. The journal is aptly named Deckard Cain's Journal. Cain originally just called himself "Cain the Elder" in Tristram some 20 years ago, known as a storyteller, and making a living by identifying items for travelling adventurers. He later admits to his Horadrim heritage to a wandering hero, and with the help of Cain, he defeats Diablo. Cain is also the only character known to have survived when Tristram was destroyed by demons, as they decide to put him in a gibbet instead of tearing him limb from limb like the other former citizens of Tristram (possibly under orders from the three Brothers to keep him alive). Cain in a cinematic storyboard. Heroes are alerted by the tragedy of Tristram by the Sisters of the Sightless Eye, and rescues Cain before he is killed, or turned over to some greater demon. The rest of the year he spends following the heroes, assisting them with knowledge of the Prime Evils and Horadric artefacts, in order to permanently abolish the demonic forces on Sanctuary. Cain is an avid story teller, and the phrase he is most known by is asking visitors to "stay a while, and listen!" 20 years later, Cain is a lot older, reaching towards the end of his life. One of the things that has plagued him all these years is that growing up, he was never much of a believer in the Horadric Order which was kind of handed down to him. It wasn't really until the events of the original Diablo that he came to realize this was all true, a serious threat. Throughout the original Diablo and Diablo 2, he re-familiarized himself with what he grew up with. He's spent the last 20 years trying to atone, he's always felt that if he had been more active earlier on, maybe he could have stopped it, maybe he could have prevented all this from happening. So that's what he's spent this time trying to do, trying to figure out how he can put an end to all of this and stop it once and for all. His urgency has become even stronger, because he knows he's reaching the end of his life. So it's made him fanatical, a little bit, a darker character. Cain's Old Journal - Part 1,2 - (required for A Quick Study achievement. Cain has described Pepin as his closest friend in Tristram, before the town was overrun by demons. He also described Gillian as a friend. In Diablo III, Leah seems like a friend, but it's not known to what extent they know each other, though it seems likely they have both stayed in Tristram Cathedral looking for clues to a demonic invasion. In the first act of Diablo II, the player is eventually required to travel to Tristram and free Cain. After this, he appears in the Rogue encampment and subsequently continues to follow the player character, staying in town in each area, dispensing advice and identifying items for free as a token of gratitude. 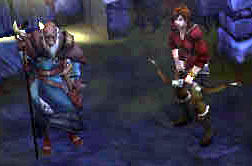 Cain has been voiced by Michael Gough in both the previous games, as well as the parts he has been seen in Diablo III. He is confirmed to appear in Diablo III. Read about Cain's character, the quests he gives, and see all of his dialogue in the earlier games in the series. Worth noting is that he calls himself the "last of the Horadrim", something that has been retconned to flavour lore with Deckard Cain's Journal. Instead, he just imagined himself part of the Horadrim as a little boy. Blizzard makes a little fun of themselves and Deckard Cain when the Barbarian character finds him in the Forgotten Tombs, and interrupts his famous quote "stay a while and listen." 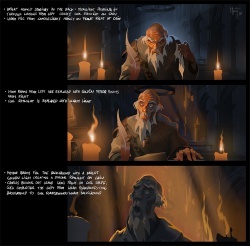 Concept art of the ageing Cain. Concept artwork for the cinematic. Concept preparation for the cinematic. Back in the days of Diablo II, Blizzard recorded and released (as a sort of Easter Egg) a medieval-themed rap song by Deckard Cain. It was an official, professional production, starring Cain's official voice, actor Michael Gough. One of Blizzard's April Fool's Day 2010 offerings was a GPS system voiced by Deckard Cain, once again starring voice actor Michael Gough.